Embed videos that won’t be indexed by Google or viewable by the public. You might want to create a video and put it on your website, but you don’t want the rest of the world to find it via search engines or YouTube. You may have a blog, and you want to give a few people access to a video that no one else will be able to watch. Give the video privacy setting “Just You.” This prevents anyone else from seeing your video. Find the “secreturl” part of your Secret URL code from Step 5. You’re going to be adding “0/yoursecretcode” to the end of two parts of the embed code. The added parts are shown in bold below. This allows your private video to be embedded publicly. Be sure to update the code for both the movie PARAM and the EMBED. That should be it! Save your post and you’re done. Thanks goes to Colin Devroe from the Viddler.com staff for presenting his solution. I wanted to share this with the world, because it’s hard to find a protected video solution that works well. They say it doesn’t work anymore, but I have tried it, and it does. Hush, hush! What’s your solution for private, embedded vidoes? I wanted to use Vimeo or YouTube, but their solutions didn’t really work for me. Do you use or know of any other, better options? I can’t get it to work, I’ve been trying for weeks to get embedded content to work that is set to private..I’ve been over it and over it, it just keeps telling me its a private video..
Why don’t you try Fliggo.com?… It’s like “private Youtube”. It’s easier. thanks! i was seraching all over for precisely this. worked!! Thank you so much for this tip. It’s exactly what I was looking for, and it works great! I’ve just tried this and I can’t get the TML code to show in my post. I paste it in and when I publish/update post it just disappears so I can’t see the code, or the video on my blog. Any ideas what I might be doing wrong??? I’ll check the tut and see how I get on. You have to pay a minimum of $100/mo now to get this functionality. That’s redonkulous! I looked into Vimeo, but even the Plus version bans ANY commercial messages. I noticed the viddler “hack” stopped working. Has anyone found another viable solution? But it still works with me – I have embedded a video today via secure link and I can see the video in my blog, at the same time the Privacy option is “Just You”. I’ve heard it still works. Any new reports? Thanks Zack! This worked for me too. Huge problem solved! this worked for me and is awesome! thanks and happy new year! Excellent instructions. Thanks so much! Thanks for this how-to. I just used it & it works beautifully! do u know what is “yishar koach”? but i have 1 problem – maybe u can solve it? when i click “edit sharig option” then i topens under the video – hidden under and then i cannot do nothing! how can i view it above the frame of the video? thanks! Thank you we have some video’s that are in house for client review only. This saves us time making dvds and halts any security issue. This is a great article. It solved a challenge I had with a client who had a video that they wanted on their site but not shared with the masses via social media. Hosting an FLV file directly on their webhost wasn’t working too well in terms of performance. This solved it beautifully. 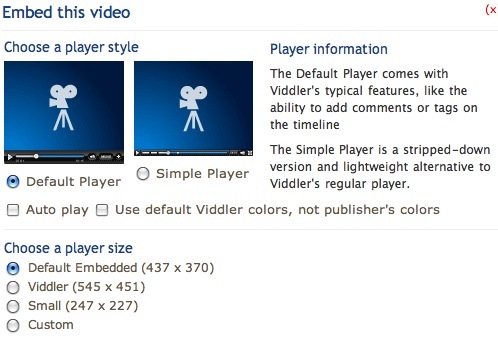 Does anyone know if Viddler changed this feature/option? Doesn’t seem to be working for me and I noticed this post is a bit old. Next Next post: You need Denver SEO if you want to rank well in Google.